While promotion shouldn't be your primary reason for contributing to your community, it probably helps to know that the college cares about and values your service to our community outside the college. So if you were hesitant to do community service, and wondering about whether or not you could or should sacrifice any of your hard-earned down-time, consider that you will benefit from donating that time -- although I'm pretty sure our community partners will benefit more. And yes, union-organized community service events count. Finally, some beautiful spring weather. 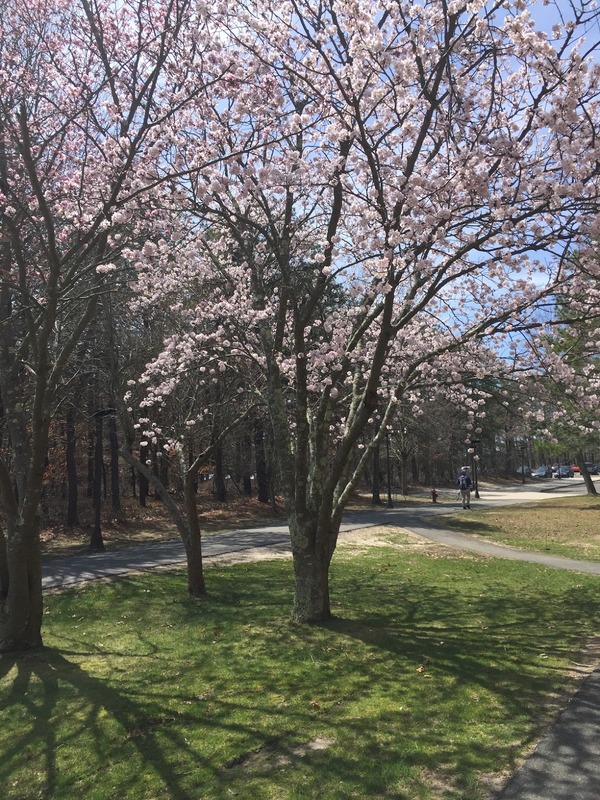 Suffolk AHRC (Association for the Help of Retarded Children) plant sales on the Ammerman and Grant campuses during the spring and fall semesters. Participation in the American Cancer Society's Making Strides Against Breast Cancer walks in October of each year. Professors on Wheels, our home-grown community outreach program that provides mini-lectures, classes and workshops on a variety of topics to local nursing homes, rehabilitation centers and libraries. Obviously, the first two options are very specific in terms of date and time and content. If you're interested in volunteering for a future AHRC plant sale, email anita [at] fascc.org and she'll make sure you're on the list for next semester. If you'd like to walk to support breast cancer research on behalf of the FA, make sure you read The Word when we return in the fall to be informed about where and when the FA will be participating in the Jones Beach walk, as well as how to donate money towards this important cause. Professors on Wheels, however, offers you a little more flexibility in terms of time and subject. When you participate in Professors on Wheels, you pick the topic, presentation-type (i.e. lecture or workshop), and length of your "course" offering -- most faculty play to their strengths and choose topics that are related to their field or discipline but appeal to a general audience. A 100-word description of the course, along with a brief biography, is required as an application -- this write up is then passed to our community partners, and they decide, based on their participants' interests, which workshops or lectures they'd like to bring to their location. Professors on Wheels has received a lot of praise and won some well-deserved attention from local news outlets -- it's a high-profile, highly-engaging and rewarding way to donate your time and expertise to the surrounding community. If you'd like to become part of Professors on Wheels, visit fassc.org and click the link under "Community Outreach" to download the application. Send it to Ray DiSanza (disanzr [at] sunysuffolk.edu) or Anita, and they'll make sure you're added to the roster of participating faculty.